The big ticket developments were the release of Affino 8, the completion and launch of the fully responsive v8 Design Centre, full GDPR and Privacy compliance, and the new Stats Engine. In all we launched twelve service updates including four major ones, and addressed over 1,500 user stories in 2018. The year started with a bang when we released Affino 8 with the new fully responsive design centre. These two have set a great foundation that we’ve been building on over the year and culminated in Affino sites running up to 300% faster, and the new Live Design mode for instantly accessing live page designs and tweaking them. We then launched the two major GDPR releases, which saw a complete overhaul of every aspect of how Affino records and manages personal information. We fully delivered on all our GDPR commitments and then addressed all the more nuanced use cases that our customers have been facing. Affino 8.0.12, which was released in December, is the culmination of six months of performance and usability optimisation, as well as major updates on the Ad service, the new stats engine, new site search and new import & export engines, all of which were top of the priority list for many Affino customers. We worked many years towards the launch of Affino 8, and the updates we’ve done this year means that we have fully realised the goal of providing an excellent SaaS business platform in terms of the overall feature set and the speed, usability, performance and reliability of the underlying service. We can’t wait for 2019 and sharing with you the new service updates we have planned for Affino over the coming year. Affino 8 was delivered in January and refined through 12 releases over the course of the year, with 4 being major releases. We will be introducing new Permission Renewal campaigns which actively target audience engagement and re-engagement for subscription and marketing re-permissioning. These bring together message campaigns, conversion events, notices and actions depending on where users are in the cycle or indeed have dropped out. New preference centre for managing all preferences, permissions and accessing terms and conditions. New contact auto archiving and deletion service for automatically removing non engaged contacts from the CRM. Greatly improved sign-ups with much tighter auditing. New Permissioning Audits for each user, showing all permissions, with exact description of permission, and audited timestamps. Includes Mailing List, Forum and Content Subscriptions. Contacts can be archived from the CRM into a secure archive with fully audited archiving process including timing, archiver and archive statement for each archive / un-archive event. All key personal information can be exported in spreadsheet (admin only). Enforced 3 month password renewal cycle for core CRM administrators. Multiple updates to facilitate the anonymity of those who have been ‘forgotten’. Whilst retaining core audit data to ensure no malicious behaviour. Updated to better support re-permissioning and enhanced mailing list sign-ups. We introduced a Cookie Dashboard with full cookie management along with a greatly reduced set of cookies, essentially removing all non-essential cookies. Live Design is now on responsive. You can access the settings and update the content of each design element from the live page. New self-management capabilities, allowing users to manage their own directory entries and upload all media, articles and associated content, as well as set the topics they are targeting. We greatly improved Dynamic Forms this year, primarily to allow for frictionless event registrations. Affino can now auto-relate form entries to known contacts, and it is possible to generate CRM contacts directly from form entries, as well as capture terms and permission acceptance with any form entry. This means that whatever the event registration form requirement, Affino can now handle it. Extensive updates throughout the year have smoothed out the rough edges of Affino’s Awards service, in particular the ability to see overviews of how each award is running, and the ability to export all awards information and media for production management. We renamed Print Products to Editions, and have re-built this as the foundation of an edition centric publishing approach that Affino will support in great depth in the future. We’re introducing a new generation site search which sees the introduction of aspected search and filtering, and will be faster, more reliable, and more scalable than the current generation. This year saw two major sets of updates to the ad campaign service, including a host of essential updates: Viewability support on the ad stats, major new ad stats engine with greatly improved insight, filters and a new export; improved targeted, improved campaign auto-balancing; improved campaign projections; and new campaign groupings. We have improved Message Campaigns in a host of ways including: improved targeting, permission management, imports and exports, help, management tweaks and the key bounce and analysis updates below. We made hundreds of tweaks to improve the user experience on the CRM over the course of the year. Contacts, Accounts, Contact Lists and Opportunity management have all seen major updates this year. We greatly evolved Affino’s registration process over the course of the year so that is is far more capable of handling multiple on-boarding streams and much more robust at dealing with non-linear registrations. We have completely re-thought how users, contacts, members, delegates, authors et al are presented on the display side, with much tighter controls and ability for users to manage the presentation of their personal contact profiles. We made a host of minor updates to media management in Affino over the year, including: support for Wistia videos, improved upload performance, related media display, comment and rating support, improved imports and exports on media details, streamlined media workflows, and most importantly you can now track all media downloads effectively with GDPR compliant lead generation. The biggest public facing set of updates have been around the checkout process which has been tweaked throughout the year to improve usability and drive up conversion rates. We introduced the new Smart Product Listing with aspected navigation, improved sorting, and a huge array of product listing options including the ability to tightly control how the listing works across breakpoints (desktop, tablet, mobile etc). Further enhancements for Pro Forma Orders and Orders, including search, renewals, messaging, status awareness and filtering. The reporting has also been improved throughout with more insight, filters, and improved performance. It is now possible to feature and manage far more detail on each product, including using Steps to present advanced product information. Hundreds of usability improvements throughout the Control Centre. We introduced a new generation of Imports and exports with a completely re-written engine which is faster, has more data integrity checks, now fully supports xlsx across all imports and exports and has improved consistency throughout. The latest generation also allows direct downloads right from the Active Tasks screen so no need to wait for emails to arrive. For Affino customers with the dedicated data service Affino provides extended data on all the data captured. New stats engine captures and classifies all site activity and performance including human, bot and ‘other’ activity. Affino now tracks over 2,200 bots and for the first time actively manages and blocks access to malicious bots. This is an area we anticipate developing extensively in the future as 95%+ of all site traffic is now bots. 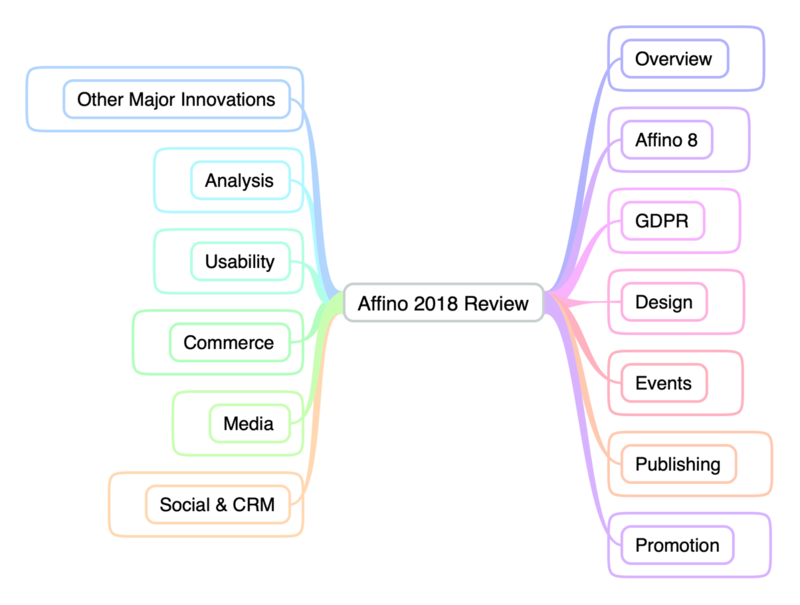 The main focus in 2018 has been to improve the speed and performance of every page, every task and all interactions throughout Affino. The speed improvements across the board range from 40% to 300%. Affino became considerably simpler this year with the removal of all the classic elements and the need to create both classic and responsive page designs. and hundreds of tweaks throughout. Whilst not yet implemented (due in January / February) we have prepared the groundwork for moving Affino to a new generation hosting framework. We introduced a new bug detection framework which has allowed us to identify and resolve issues across all client instances. This has lead to a greatly improved service offering overall. Whilst Affino now retains considerably more insight data than previously we have worked hard to optimise this wherever possible, resulting in far more efficient data storage. It is now possible to include 3rd party integration scripts across entire sites using Zone scripts. We have maintained a tight security focus throughout the year and Affino’s services have been extensively tested with millions of penetration attempts, DDoS attacks, and ceaseless vulnerability scanning by both criminal and government bot networks. We have looked at all points to resolve all identified issues in the shortest timespan and have considerably improved Affino’s ability to fend off low level attacks, we well as roll out enhanced firewall infrastructure when needed to fend off DDoS attacks. We have also completely overhauled how the Affino team interacts with client sites with all interactions based on clients granting access and permission.